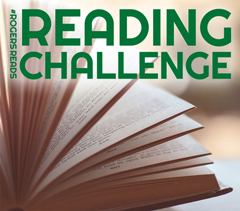 If you missed out on the reading challenge last year, you can now join the #RogersReads Reading Challenge for 2019! You will have 12 months to complete 12 reading prompts that include challenges such as reading a work that’s less than 200 pages, reading a work that’s been made into a movie, and reading a historical fiction novel. For every challenge you complete, you will be entered in our monthly drawings where you can earn things like gift cards to The Friendly Bookstore, free books, and other bookish goodies. If you manage to complete all 12 challenges by January 31, 2020, you’ll be entered in the Grand Prize Drawing! There’s only a few rules to this challenge. You must have a Rogers Public Library card. You cannot use the same book for multiple challenges, and you must be 18 years or older by January 31, 2020. Other than that, go wild with your reading choices! You can use an audiobook, ebook, or physical book. You can choose to read all Middle Grade or YA books. You can even try to find 12 graphic novels to fit the reading prompts. You do not have to complete these challenges in order; choose the one that sounds the most fun and go from there! We will be creating reading lists on social media and on our book displays in the library throughout the year to help you find books. You can also ask the librarians to help! We love finding people new books to read. Registration is now open on the website, which can be found here. You can also come by any of the service desks to pick up a list of the challenges if you would like a paper copy. We will be happy to help you register and log your books.